Linebacker Marty Schottenheimer was selected in by both the AFL (Buffalo, 7th round) and NFL (Baltimore, 5th round) of their respective 1965 drafts out of the University of Pittsburgh. He spent 4 seasons on the Bills roster (where it was comically shown on the retrospective “Full Color Football” that Schottenheimer’s name was so long on his jersey the type ran off the name plate and onto his right shoulder). He’d earn All Star honors in 1965, and be traded in 1971 to the Pittsburgh Steelers and again to the Boston Patriots before retiring. Schottenheimer went into coaching in 1974 and worked for the Portland Storm in the World Football League as a linebackers coach, but before you knew it, less than 10 years after he got drafted by the Bills, Schottenheimer was coaching linebackers for the Giants in 1975. He’d then coach for the Lions on another 2 year stint, before catching on in 1980 with the Cleveland Browns as defensive coordinator where he established a smash mouth defense. 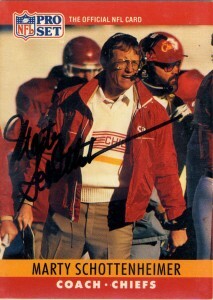 In 1984, he’d get his chance as head coach, when Sam Rutigliano was fired midway through the season. He’d then be the face of the Browns for the next 4 seasons through 1988. The Browns would experience their last consistent slate of respect and success during the Schottenheimer era. He’d also establish what is commonly referred to as ‘Marty Ball’ and the team would lose two heartbreaking games in the playoffs, known as ‘The Drive’ and ‘the Fumble’. With the reemergence of the Oilers in 1988 as playoff contenders, The Browns would host them in the first round of the playoffs. Although favored to win, the Browns lost by a point. After the season was over Marty was fired, which angered many fans. His legacy with the team over 4 seasons was a large one as he finished with a 44-27 record and a 2-4 mark in the playoffs. The Browns alsobadvanced to the deepest levels of the NFL playoffs since before the AFL merger. Schottenheimer wouldn’t be on the market for long. He’d head over to the Kansas City Chiefs to coach there for the next 10 seasons turning the team around from a laughing stock to playoff contender in 2 seasons. He’d win over 100 games with the franchise and the Chiefs would make the AFC Championship game in 1993. In addition they won the division 3 times and made 7 playoff appearances in those 10 seasons. He quit after a disappointing 1998 season. Marty served as an analyst for ESPN for a season or two, and then was hired to be coach of the Washington Redskins in 2001. Sights were high for the capital city after Schottenheimer came to town that year and the media circus quickly circled Marty. With Deion Sanders ducking out the back door and quickly announcing his retirement to get away from Marty, controversy erupted. Schottenheimer installed his brand of Martyball and the team was off to a slow start out of the gate losing its first 5 games. The media portrayed Marty as being outdated and out of touch with the current league, both with players and in offensive philosophy. The Redskins would respond by winning their next 5 games- (a first in NFL history) and narrowly missed the playoffs at 8-8 . In fighting between Schottenheimer and owner Daniel Snyder, as Marty wanted more control of the franchise. He was unceremoniously dismissed after one season. Marty was quickly named coach of the San Diego Chargers, where he’d guide the team to two playoff appearances and named coach of the year in 2004. Despite posting a 14-2 record in the latter season he was fired. -The first coach to be fired after securing the home field advantage through the playoffs. The reason for his dumping ranged from the fact that he had a 0-2 playoff record with San Diego, to charges of nepotism as he brought on more of his family on board as coaches. A public fight between the Chargers and Deion Sanders didn’t help either, when Sanders announced his ‘unretirement’ to come back to the league to play for the cross state Raiders, Schottenheimer quickly nabbed his rights before the Raiders. Sanders tore the team for its archaic practices and swore never to play for the team. In the end, the Bolts continued to hold Sanders’ rights throughout the season. Anyway regardless of it all, Schottenheimer was fired in what was considered without cause and still collected his salary for the next season, which damned the franchise even more. Marty has been since rehired to be an analyst by ESPN where he does an excellent job. After the Jets victory in the 2009 playoffs last season over heavily favored San Diego Chargers, coached by Marty’s replacement, he received a game ball in the mail from the team. His son coaches for the Jets and Rex Ryan felt his firing was an injustice to the game. Schottenheimer’s greatest legacy besides the sheer number of victories is the impact of his coaching tree. A Lou Saban apostle, Schottenheimer has many notable coaches that have been under his wing including: Marvin Lewis, Bill Cowher and Tony Dungy. To this date, Marty Schottenheimer is the winningest coach in the NFL not to be inducted into the Hall of Fame with 14 winning seasons in a 21 year career. I really lobbied hard and hoped the Texans would hire Schottenheimer after they released Dom Capers but have been pleasantly surprised with Kubiak in the meantime. I got Marty’s autograph after the 1992 season in a few week’s time. Marty does want to return to coaching and was rumored to have been in line for the Buffalo Bills job in 2010, but the team went in a different direction. Update- In 2011, Marty Schottenheimer created quite a buzz when he signed to coach with the Virginia Destroyers of the UFL. He won the UFL championship later that year before the league was reorganized.